On city buses and streetcars, you pulled a cord to request a stop. The cord caused a bell or buzzer to sound -- every time the cord was pulled. after which the bell won't sound anymore until after the doors are closed again. Kinda takes away the opportunity for teenagers to be (as) obnoxious. When I was a kid, the cord was usually pulled by multiple people to ensure that the driver knew they wanted to get off. Eventually the MTA installed a light hanging from the ceiling at the front of the bus that read "Stop Requested" after the first person pulled the cord. This way the driver wouldn't lose his mind and the cord and bell wouldn't break. We don't have anything on the city bus here. We simply shout, "Next stop, please!" Just as great, our bus stop was at the fire station and I remember the fireman putting his boots on me (or me into his boots) and they actually had a dalmatian. The downside was it meant a trip downtown to the cursed department stores to try on clothes, etc. although they still had elevators with a seated operator and wooden escalators. The transit buses here in San Diego always had the pull cords for as long as I can remember. Cords are returning. The newest buses in NYC have them. 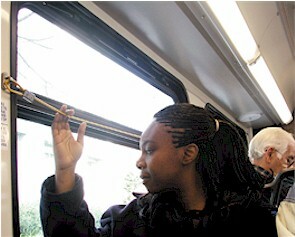 Transit agencys have finally realized the touch tape is more costly to maintain.